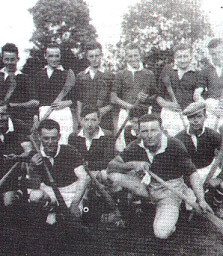 Between the years 1935 and 1936 the traditional game of hurling was introduced to Lavey. Today, nearly fifty yeas further on, that tradition still exists despite the apparent apathy towards the game throughout much of the county. Indeed we are happy to relate that rarely has the enthusiasm for the game in Lavey been greater than at present – it is not uncommon to regularly find up to forty juveniles in the pitch, practising the considerable arts and skills of the game under the watchful eye of enthusiasts like Tom Magill, Colm Henry, Paddy Dillon, Louis Regan and Hugh Martin McGurk. Some of the first players to represent Lavey in the 1920’s. Fr. James McLaughlan a young curate who came to the parish about 1934 was the man responsible for launching hurling in Lavey. Soon after his arrival he had formed a hurling club, although it is believed that they- did not participate in serious competition until 1935. The club was called shamrocks and for a period was independent of the football club, Their original colours were green jerseys with a white shamrock on the breast. They were problems for the young Shamrock’s, not least being the lack of funds for travel and Hurleys – the lack of competition within a reasonable proximity. The only Hurling teams in Derry at that time were city-based teams like St, Patrick’s, Sarfields. Eire Og and Burt. Whilst Fr. McLaughlan succeeded in enticing a couple of these teams to Lavey for challenge fixtures, it was obviously impractical for the Shamrock’s to operate in the same league. As a result they participated in the South West Antrim league with teams like Toome, Cargin, Creggan and Randalstown.